Today I have a great idea to share with you! It's a hand made ornament! 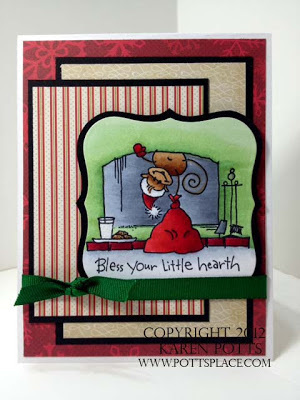 I used one of the clear ornaments and embossed a backgound image on the transparency. 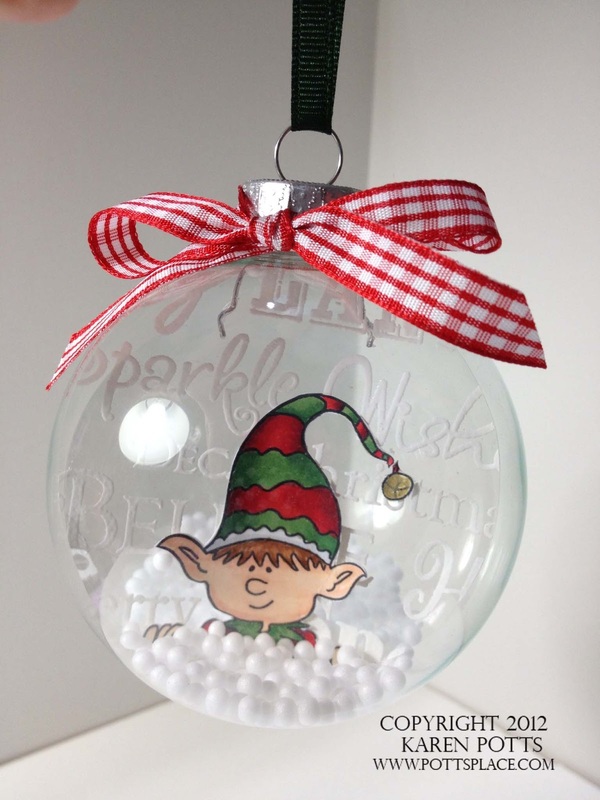 I then stamped my cute little elf on cardstock and attached him to the transparency and put it in the ornament! 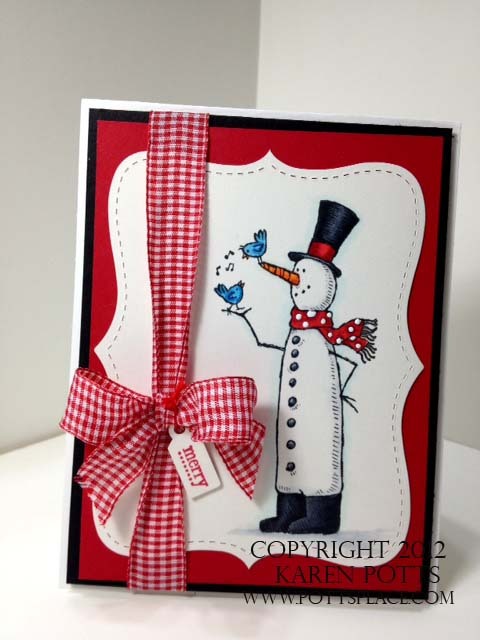 Add a little festive ribbon and and some snow and you have an adorable decoration for your tree! 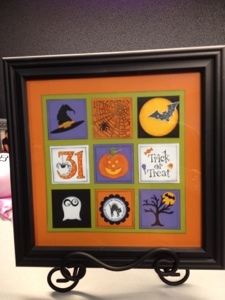 You could personalize these with a photo and/or print out of the year or event! The possibilities are endless! Posted by Karen at 6:55 AM 1 Click here to leave me a comment. 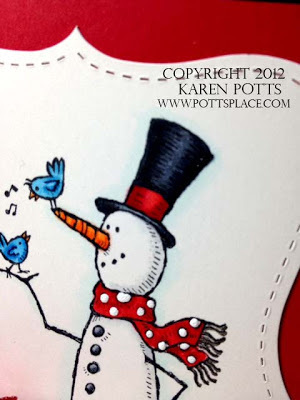 I have the cutest snowman to share with you today! 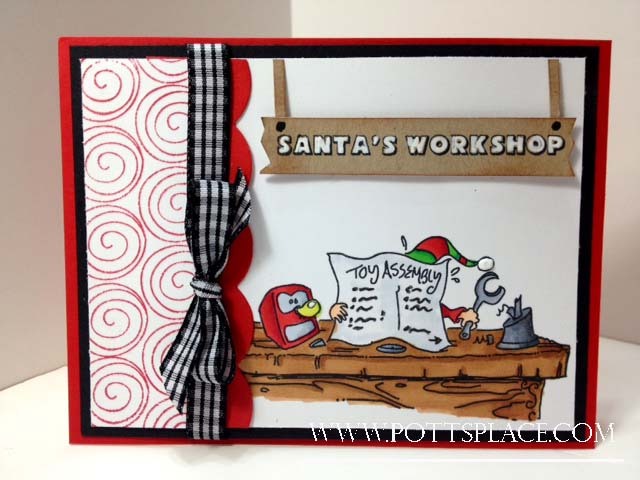 I have wanted this stamp from Stampin Up since I first saw it in the catalog I love his size! 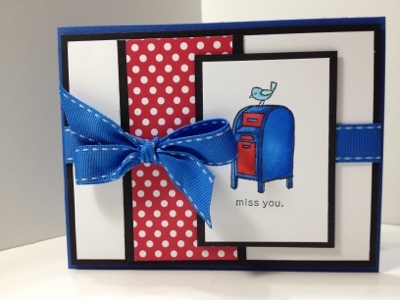 It's hard to find stamps that allow you to fill up space on your cards! This one is perfect! I started by stamping the snoman on shimmery white cardstock (I just love that sparkle) and colored him with my Copic Markers. You can see the detail here on this close up. I used the Copic Opaque White Ink to make the dots on his scarf. It creates nice texture and draws your eye in. Once I got him all colored I assembled the card and added the long ribbon and finished it off with a Tiny Tag attached with DMC floss. The ribbon has wire in it and creates a nice "puffy" bow which reminds me of a beautiful Christmas package. Here it is all assembled and complete! There are a few more favorites in this set which I will be sharing with you in the next week. Enjoy! Posted by Karen at 11:13 PM 1 Click here to leave me a comment. A Goal and the cutest little snowman! It's Wednesday already and I haven't comleted half the stuff I wanted to do this week! What I have accomplished is hitting my goal weight and I didn't think that last pound would ever go away! Between alternating running and the Y every other day, I have made great accomplishments getting into shape! Saturday I finally hit my goal weight! If you are struggling with those pounds as I was, don't give up! You will get there, just keep telling yourself I CAN do it and I WILL! I would have never considered myself a runner but I am here today to tell you I AM a runner! Every day I do a little better and accomplish a little more. It is a very satisfying feeling to say I can do this! We are already signed up for our next 5K! 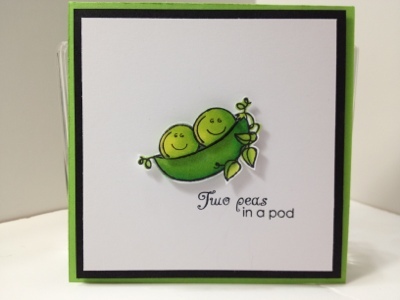 On to today's card! I made this with all intentions of using a cerain paper I had stashed away for the perfect card but got so excited coloring, it didn't even match when I was done! 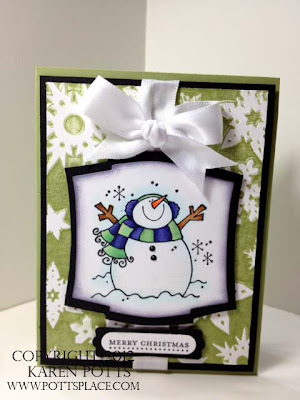 LOL I pulled out my snowflake embossing folder and my Pear Pizazz ink and inked up the embossing folder and embossed white paper so the snoflakes stand out and the inking colored the background! I love the bold white look! The image is colored with my Copics and I have added some "shimmery snow" details with the clear Spica Glitter Pen! If you haven't tried these they are a must! The glitter is actually tine particles of glass and they hav an awesome sparkle! If you only buy one get the clear, you can use it on anything! It does't show up well in the photo but it adds a nice "wow" in person! Posted by Karen at 9:42 PM 0 Click here to leave me a comment. This months challenge over at Raisin Boat was a treat for Halloween! 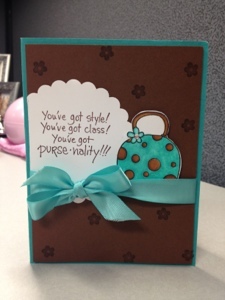 Mine was simple but when you have to make for a large group I do simple. I make a "treat" for my co workers for all of the significant holidays. Some of them have a years worth in their desks! 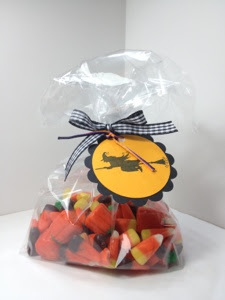 I used a cellophane bag and added my candy and added the tie with a cute little tag! You could change the stamp and color to accommodate any holiday or occasion! 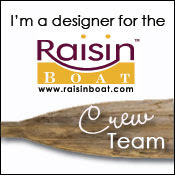 Hop on over to Raisinboat to see the other awesome projects have been created by the talented Raisin Boat Crew! Posted by Karen at 8:36 PM 1 Click here to leave me a comment. Happy Monday Peeps! It was a fast weekend. All day Saturday was spent shopping the thrift shops for Halloween attire! WHERE in the world do they get all that "stuff" to sell? It was hard to find something when you're not sure what you're going to be but I managed to find two things. One I'll wear for another party coming up! 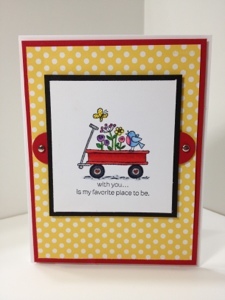 I was cleaning up the craftroom this week and looked through all of my shape dies and said to myself I really need to be using these so that was my challenge for this week....USE THEM! 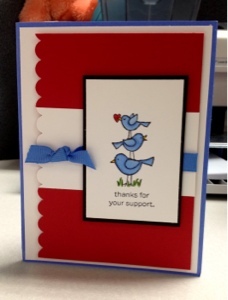 I found a sketch on pinterest and went to work assembling my card. 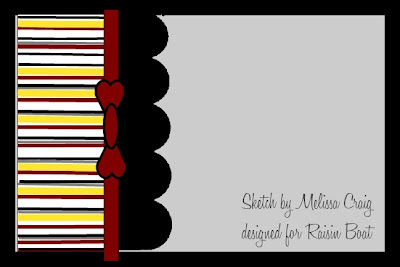 I did use quite a bit of patterned paper which I find is another thing I don't use very often but I LOVE to collect it! I challenge all of my readers to use something they have set aside. It's quite refreshing and a great challenge! Posted by Karen at 6:22 AM 0 Click here to leave me a comment. I'm trying to get in the holiday groove early this year as I am in the process of planning my holiday classes. 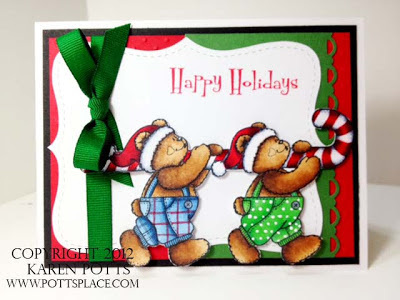 I was going through my Christmas stamps and found these bears and they just seemed to be calling "color us". I haven't done a project with my copics using the "fur" technique so off I went on this sidetracked adventure! I ended up using 22 markers to color these little "cuties" and a red spica pen! They turned out pretty good, if I do say so myself! Once I completed the coloring I automatically started cutting them out, nother chore in itself and I have looked at them for two days and finally decided on a design for them! I layered the top note die onto a scalloped edged and dot embossed background and popdotted the bears! 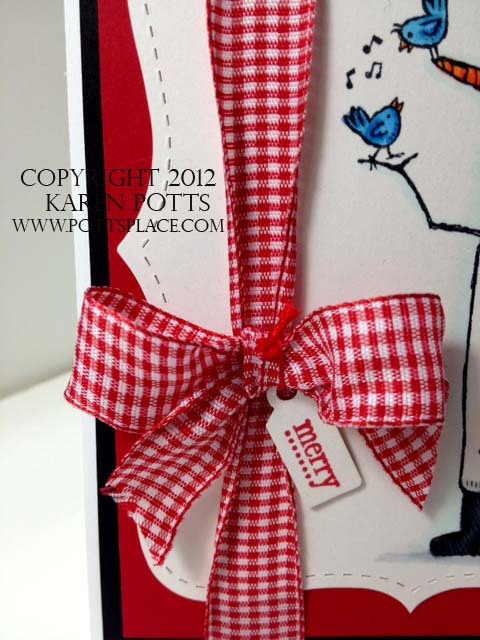 There had to be a little ribbon as what's a Christmas card without a bow so I decided on the green! Back to selecting stamps for my classes now! Posted by Karen at 9:32 PM 0 Click here to leave me a comment. The house is so quiet this morning! I dropped off the high schooler, hit the gym and then took the dog for a long walk! Packed up my card submissions that are being sent out for publication and almost ready to head to make a couple of returns. 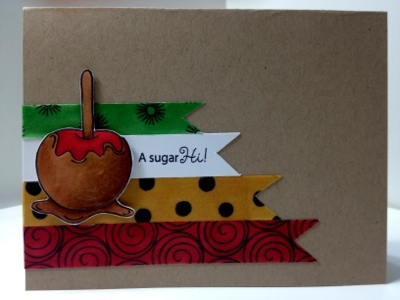 Now on to today's card! 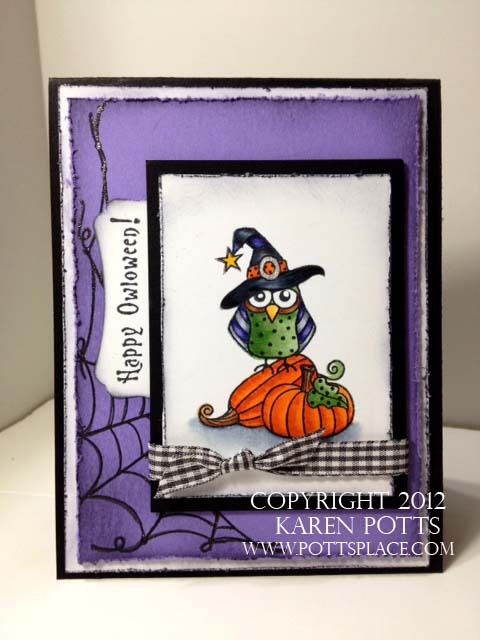 It's a Krafty Kimmie's Stamp called Perfect Potion! I thought it was adorable but didn't realize how much work it was to color! I think it turned out fantastic though! I love the deep colors. Her dress is purple but I photographed it every which way I could think of and it still shows blue in the pic! 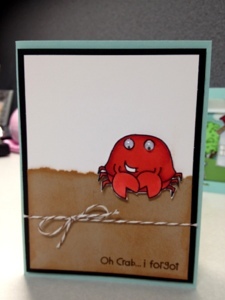 It's still cute as can be! 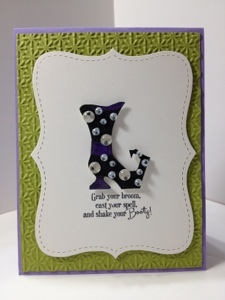 I layered the cardstock and embossed the green and purple pieces with the chevron embossing folder by Stampin Up! 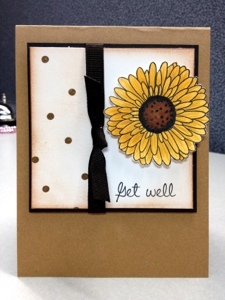 I cut her out and attached her to the die cut piece and distressed the edges. I also added a little ink to the bow to distress it and knock off the bright white. 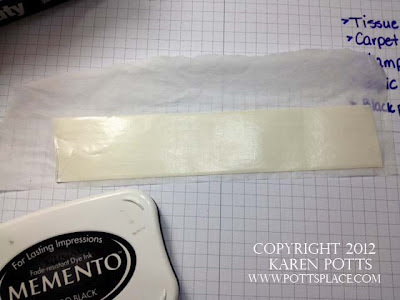 STAMPS: Kraftin Kimmie Perfect Potion! Posted by Karen at 11:14 AM 0 Click here to leave me a comment. Happy Birthday Christa! Can you say FABULOUS! 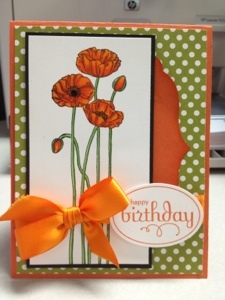 Here is her card! It's all colored with Copics! Took a while to do but I love the results! Happy Birthday Christa! Posted by Karen at 8:57 PM 1 Click here to leave me a comment. 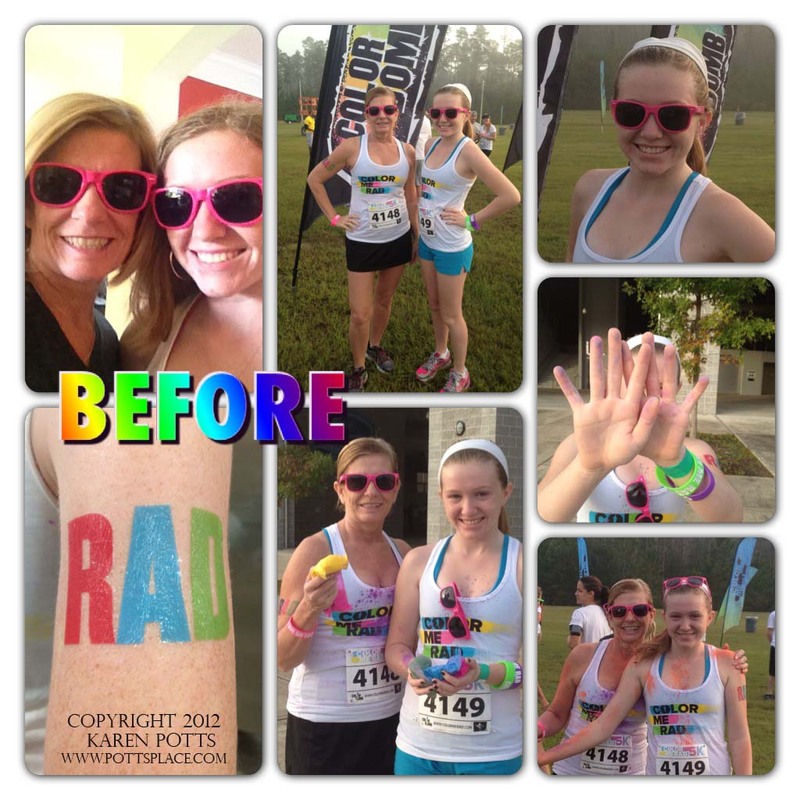 Color Me Rad, it doesn't get more colorful than this! What a wonderful weekend we had. For some time now I have had the urge to RUN! I never considered myself a runner but for some weird reason it just hit me so I talked to my daughter and we decided to sign up for a 5k RUN! Now the big questions was what run should we do? We had no idea there were so many choices. Once we found the Color Me Rad run and knew it was the one to start with! This day started in a nice bright white shirt, RAD sunglasses (we girly girls had to have pink). I have never seen so many people wearing white! After a few announcement, pep talks and random give aways, or should I say throw aways as they just threw stuff into the audience, we were ready to go! Our run took us through the trails of the Jacksonville Equestrian Center, a nice wooded path with a few bomb squads to pass. At each bomb squad station, we were met with bombers with LOTS of color and they didn't hold back. 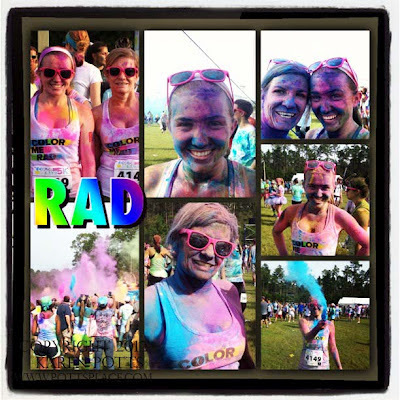 We were doused with color, head to toe! At the end of the race, there was a grand finale celebration of....you guess it, color bombing! What started out good clean fun, ended up an awesome colorful day! If you ever get the chance to participate in one of these event, don't miss your chance! It's a great family outing, and if you're not a runner you can walk the course! There were two 78 year old ladies that did just that and they were just as colorful as we were....and excited too! We have already found our next race...the Color In Motion....same concept, lots of color, LOADS of fun! 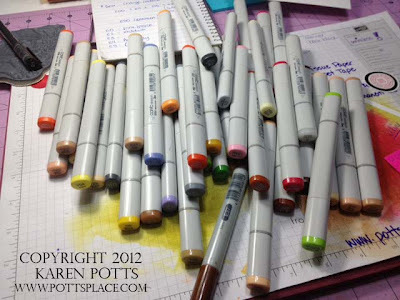 Speaking of color, here is a photo of the Copics I used to create ONE card tonight! It took me all night to do one project! I will share it with you once I get it all together! Posted by Karen at 10:39 PM 0 Click here to leave me a comment. 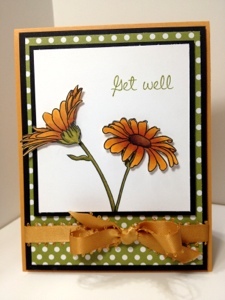 Todays card is made using the Raisin Boat Oops a Daisy set. 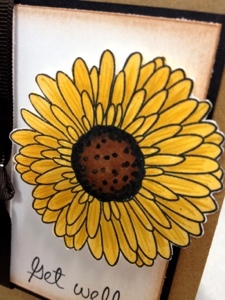 I love to color the daisies with my Copic markers. They just seem to come to life once you add in the shading. I kept it simple but I think it gives it a very elegant look. What do you think? I hope everyone has a safe and blessed weekend. Enjoy! Posted by Karen at 6:48 AM 0 Click here to leave me a comment. Here we are fast approaching another weekend. 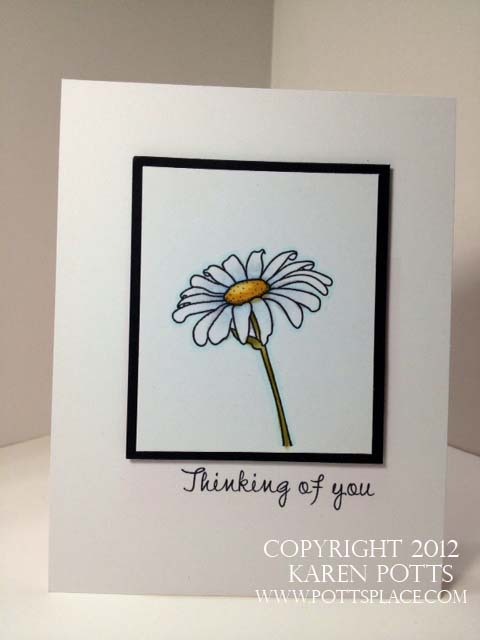 It's been a busy week, cardmaking, paintng and homework! I have a huge room for my studio and it's always a work in progess trying to find the pefect solution to storing everything! 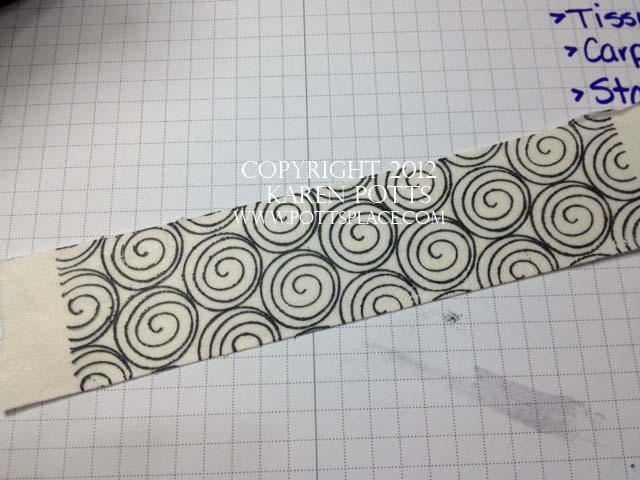 Well I have eliminated having a collection of one thing...washi tape! I have nevre bought any and once I learned this technique I never will! Start by adhering your tisue paper to the Double sided tape. Do not remove the backing (smooth side) until you are ready to adhere to your card. 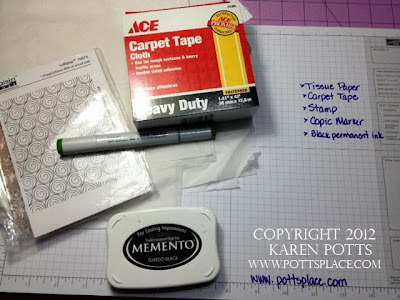 Use your finger to rub the tissue to make sure it' all in place. 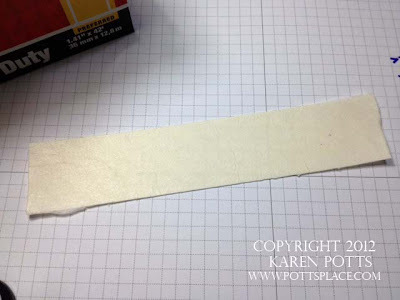 Trim to the side of the tape. Don't worry if it wrinkles, just use your finger to smooth it out! 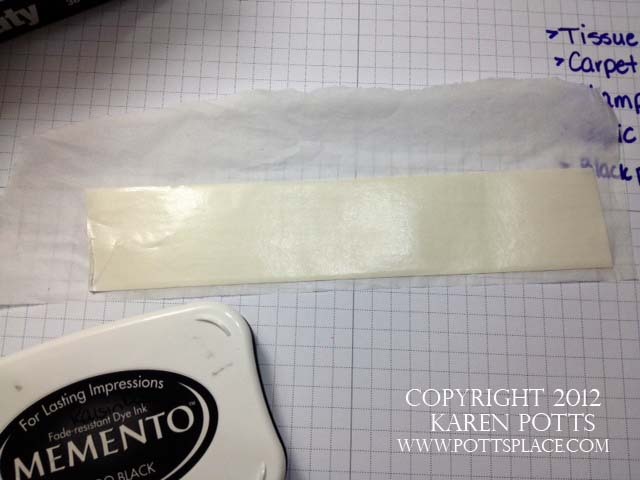 Stamp your image onto the tissue papered side of the tape. 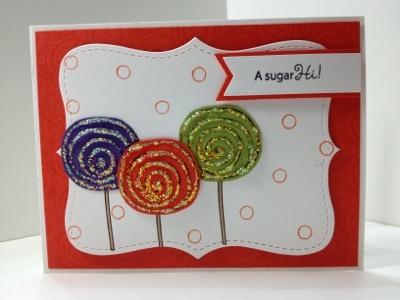 I chose the Lollipop Stamp from Raisin Boat. 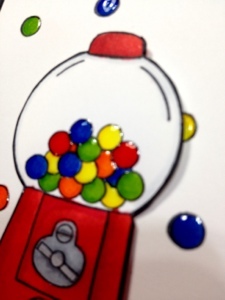 Using ANY color Copic Marker (WOW WOW WOW) and color your image. I suggest one color unless you are very careful as it will run. 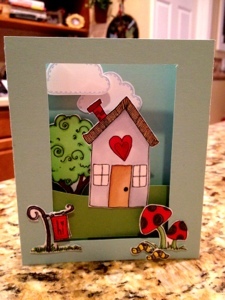 Cut it to size and remove the backing and apply to your project! 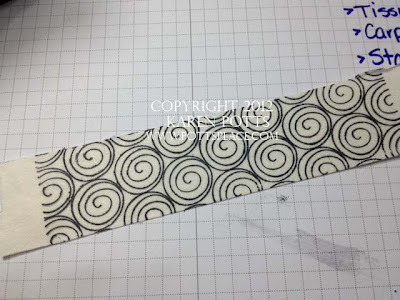 You can cut it to a small width or make it as long as you want as it is in a roll! If you have any questions, please leave a comment or email me directly! 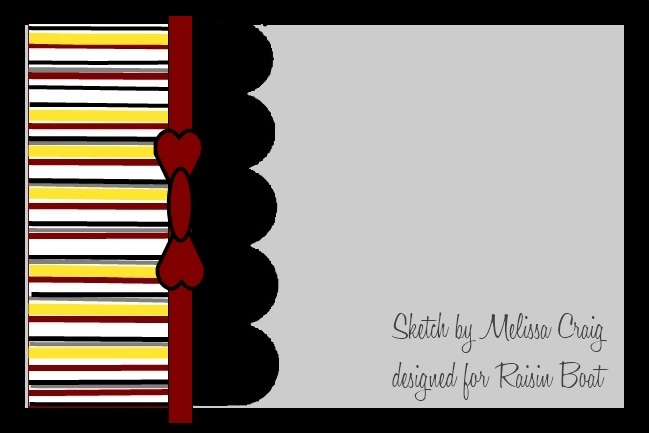 I would love to see your projects using faux washi tape! Link them in the comments to share! Posted by Karen at 10:44 PM 0 Click here to leave me a comment. TGIF!!! 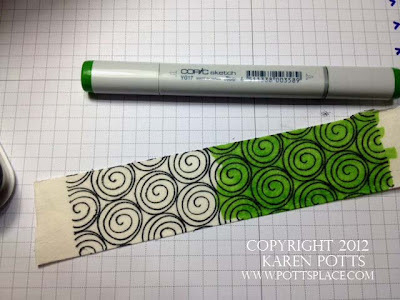 I cannot believe last week this time I was just getting ready to start my Copic Certification classes! It has been a fast and busy week. I believe there are fourteen weeks until Christmas! I hope everyone has a safe and enjoyable weekend! Posted by Karen at 9:54 PM 0 Click here to leave me a comment. This week is just flying by! Busy weekend ahead with football game, class and whatever else comes our way! 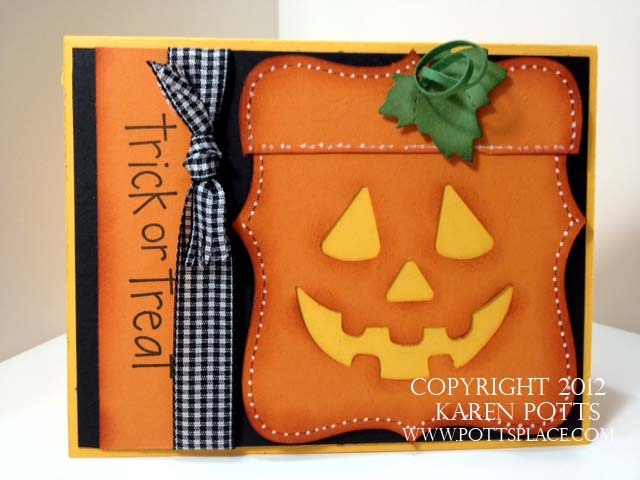 Todays card is made using the Stampin Up Top Note Die to create the Jack o Lantern and the EK Success punch to do the face. 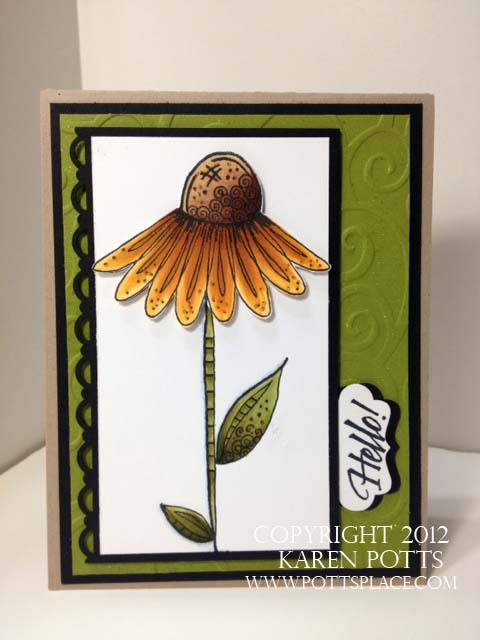 I cut the top of the top note die for the "lid" and used ink to shade around the face and edges. For a finishing touch I used my white Signo pen to "stitch" around the pumpkin. Posted by Karen at 7:04 AM 1 Click here to leave me a comment. Happy Hump Day! I am recovering from a major sinus headache and my head still hurts even though the pain is gone. Bring on the change of weather! 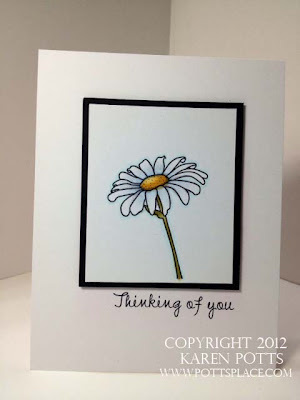 Todays card is made using the Outlines Stamps from Hampton Arts. I colored the cute little owl and pumpkins with my Copic Markers. I'm working on new techniques but it's going to take a while to incorporate them all into my creations! I did a lot of shading and accented the owl hat and cape with the spica glitter pens. They add such a nice subtle shimmer to any project. I also outlined the spider web with the black spica. his eyes are highlighted in Opaque White. The edges have been distressed and shaded and layered with dimensionals. Posted by Karen at 10:40 PM 0 Click here to leave me a comment. 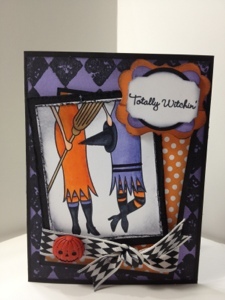 Totally Witchin! I'm Copic Certified!!! Taking the certification class brought on a whole new beginning of the way I look at things. They are not so simple anymore! It's a whole new ballgame! 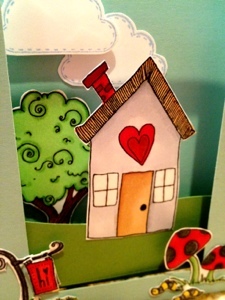 So be on the lookout for some "out of the box" creations! 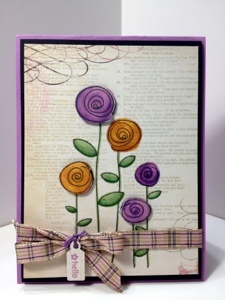 I actually made this card before I went to class It was made using a My Favorite Things stamp set and Stampin Up background stamp, background paper and cardstock. 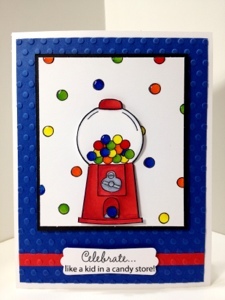 Don't forget to check out the Designed to Color magazine website for their latest issue. 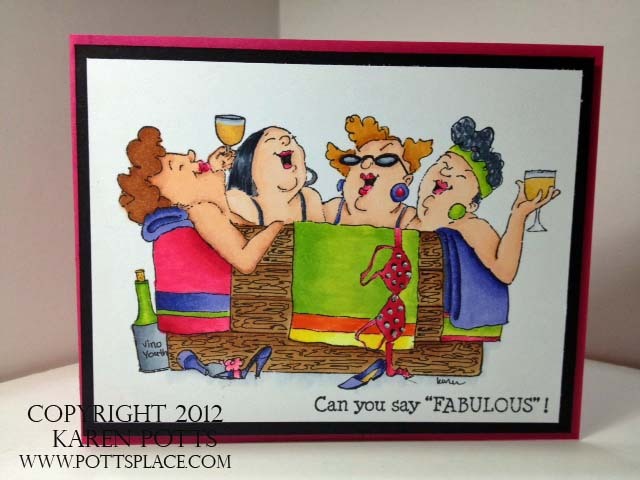 I have two cards published in that issue and will have a couple more published later this year in other publications! Thanks for stopping by! Posted by Karen at 4:28 PM 0 Click here to leave me a comment. Happy Sunday everyone! I hope it is as beautiful where you are as it is in sunny Florida! It's been a busy week around here and I'm catching up on some deadlines and taking care of a few things around the house. 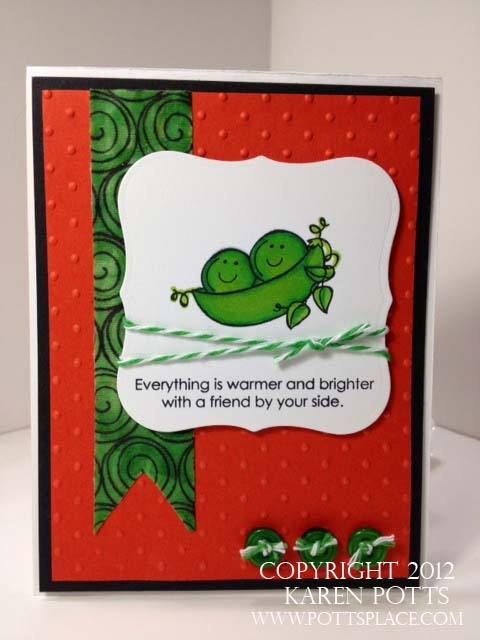 Today's card is a Challenge posted over at the Raisin Boat Blog. 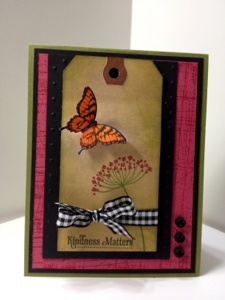 You can hop over and give it a try and see what other fellow stampers are doing! There are some great ideas there! 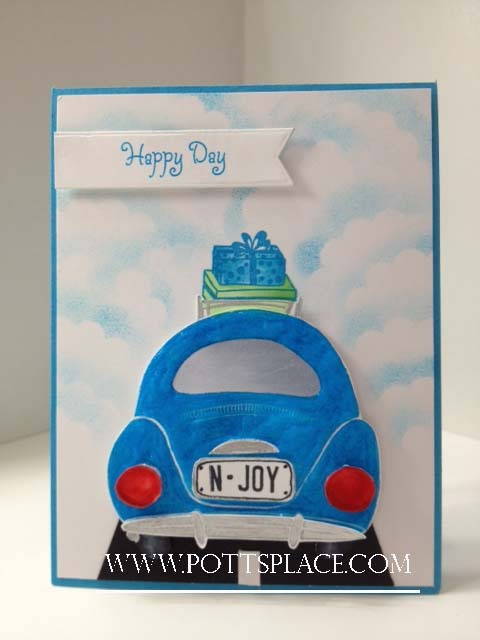 I just love the cute little party car they have and used it for my Challenge. I cut it out in pieces and layered each piece for my 3D look. I used the Diva cystal clear to make my car and tail lights "shiny". I used the Signo silver pen for the bumber and light over the license plate and colored the tail lights and tires with my copics! Posted by Karen at 1:58 PM 1 Click here to leave me a comment. Hello everyone! I have exciting news....I've been published twice in the new issue of Designed to Color Magazine! You won't see my cards in the preview but you can see what the issue is like and purchase a digital copy or order a hard copy! I can't wait to hold it in my hands! 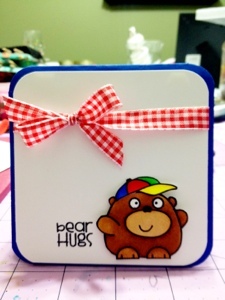 Stay tuned for more awesome ideas!!! Posted by Karen at 10:37 PM 1 Click here to leave me a comment.